Preheat oven to 375 degrees F (190 C). Grease or paper line a 6-cup jumbo muffin tin, or a 12-cup regular size muffin tin. Set aside. Combine all filling ingredients in small mixer bowl. Beat at medium speed, scraping bowl often, until well mixed (1 to 2 minutes). Set aside. In a large mixing bowl, combine the flour, baking soda, ground cinnamon, ground ginger, ground nutmeg, salt and the sugar. In another bowl, combine the vegetable oil, water, pumpkin, and the eggs. Add to flour mixture, stir just until moistened. Spoon half of the pumpkin batter into the muffin tins, filling tins about half way. 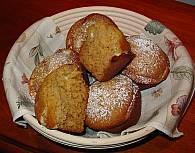 For regular size muffins spoon 1 tablespoon of the filling mixture in the center of the pumpkin batter. For jumbo size muffins, spoon 2 tablespoons of the filling mixture in the center of the pumpkin batter. Spoon the remaining half of the pumpkin batter over the filling mixture. With the edge of a knife swirl together the pumpkin batter and the filling mixture. Bake in preheated 375 degree F (190 C) oven for 25 to 30 minutes or until wooden pick inserted in center comes out clean. Cool in pan on wire rack for 5 minutes; remove muffins from tin and transfer to rack to cool completely. Muffins are best served warm. Sprinkle with confectioners' sugar and serve with butter, if desired. Makes 6 jumbo or 12 regular size muffins. I thought that they were very delicious but still a bit dry. But overall i thought they were very good!